I am extremely pleased to introduce our new website, which is being launched as we celebrate our 20th anniversary. Twenty years ago, a very big company called British Airways entered my world and entrusted the biggest promotional stunt in its history to me and my very small “company,” which, truth be told, didn’t yet exist. Goodman Media literally took off with that assignment – publicizing a half-size replica of the Concorde atop a building in Times Square, and how appropriate that our “world headquarters,” pictured throughout the new website, overlooks that site today. During these 20 years, we have worked on countless campaigns, media events, interviews, stunts and crises, while embracing the exciting new world of social and digital media. And we have grown in size and expanded into areas such as the media, publishing, digital, professional services, arts & entertainment, travel & lifestyle, healthcare and not-for-profit sectors. It has been an incredible 20 years, and we look forward to many, many more. On behalf of everyone at Goodman Media, we wanted to take time to say thank you for your support and help in making the past two decades a success. We hope you enjoy the new site. CEO Tom Goodman is pictured in Times Square, on our very first client assignment for British Airways. As the firm's first client in 1996, Goodman Media handled the media for British Airways for the unveiling of a 100-foot-long replica of the supersonic Concorde jet in New York City's Times Square, generating media coverage around the world. Pictured here: CEO Tom Goodman in the flip-phone era. 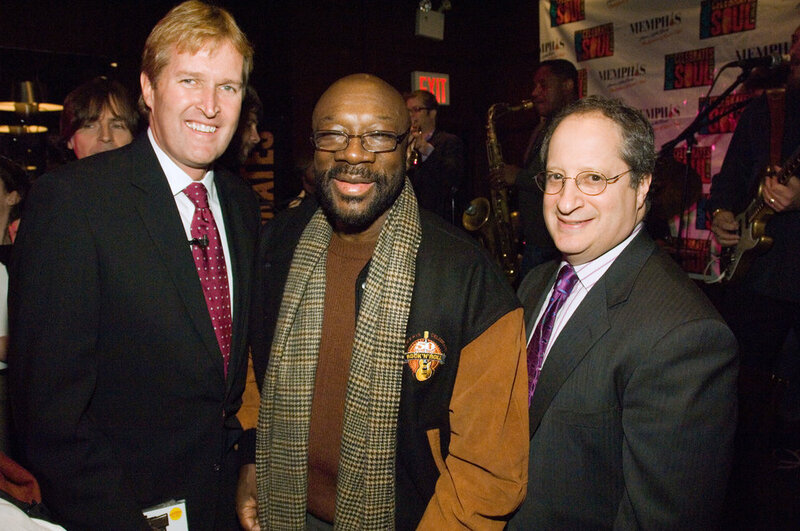 Kevin Kane, President of the Memphis Convention and Visitors Bureau, and Tom Goodman celebrate 50 years of soul music with legendary singer and composer Isaac Hayes. Our work for the city of Memphis on the 50th anniversary of Rock and Roll campaign was a highlight of our 20 years in business. Jerry Klein, Chairman of the Memphis Convention & Visitors Bureau, was a beloved client and friend, Southern hospitality and all. It was a thrill to meet Isaac Hayes, Scotty Moore, Justin Timberlake, and "Sam The Sham" Samudio. Goodman Media assembled Music Ambassadors Isaac Hayes, Scotty Moore, Justin Timberlake and "Sam the Sham" Samudio to commemorate the 50th anniversary of Rock 'n' Roll in Memphis. This poster, commissioned for GMI's 10th anniversary, hangs in our lobby and showcases our many years of great partnerships with our clients. 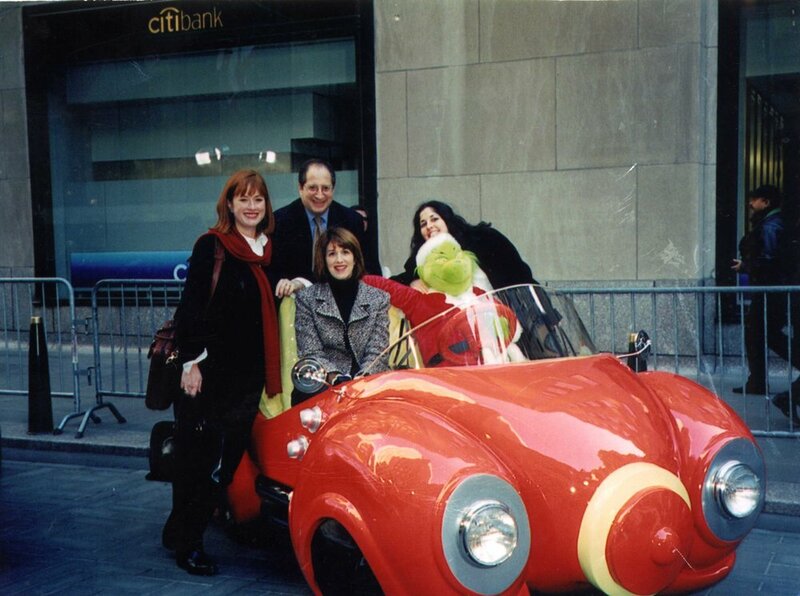 A fun 20th anniversary memory of ours: the futuristic “Goodman Media van” at NCTA in New Orleans years ago. Thanks to our client Andy Mauck of MSV Vehicles, Columbus, Ohio, for delivering it to Louisiana for us. It was great.